German shock troops would have landed at Dover, dressed in British uniforms, if the Luftwaffe had won the Battle of Britain, newly-released files suggest. Details of the plan to invade Britain emerge from a post-war debrief of a German soldier and are in an MI5 file made public at the National Archives. Cpl Werner Janowski was interrogated about his wartime work for the German Intelligence Service, the Abwehr. The plan was abandoned because invading troops would have faced RAF attack. Dover was to be the focal point of the invasion, but troops would have landed elsewhere along the south coast, as well as in Scotland and the south of Ireland. Dr Ed Hampshire, principal records specialist at the National Archives, said: "The idea of shock troops wearing enemy uniforms, as they had in the Low Countries, is fascinating. It's really The Eagle Has Landed stuff." "It gives an indication of what might have happened if the Battle of Britain had gone the other way," he said. After the shock troops had captured the docks at Dover, the plan was for the main contingent of German troops to be brought over in barges and disembark at the docks. Cpl Janowski described how his unit trained extensively in invasion techniques on the beaches of France during September and early October 1940. But at the end of October some units were transferred elsewhere and they realised the invasion - Operation Sea Lion - had been called off. Hitler cancelled the invasion because Hermann Goering's Luftwaffe had been unable to destroy the RAF and without air superiority the German troops would have been too vulnerable. Cpl Janowski said the RAF destroyed most of the invasion barges at Dunkirk in bombing raids in December 1940. 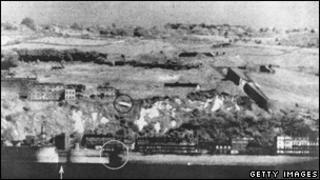 The plan involved a huge aerial bombardment of the Dover area prior to the shock troops' landing, he explained. Cpl Janowski then went into great detail about the route they would have taken to try to and secure the town: "Having effected a landing they would proceed along the cliffs to a point outside Dover where there were steps leading down to the beach and from this point they were to continue along the beach. "They would regain the cliff head by means of some steps near Dover station and then pass alongside the railway station and take possession of three docks on which were gun emplacements. "They would then signal to Luftwaffe that the docks were in their possession." By the time Cpl Janowski was being interrogated, the war was already over and MI5's focus was on another enemy - the Soviet Union. Cpl Janowski had been employed later in the war by the Jahnke Buro, a section of the Abwehr which it was feared had been infiltrated by Soviet agents. MI5 feared some German agents, like Janowski's superior Wilhelm Hollmann, might go to work for the KGB.